We are certainly in the midst of a transformation in the way that 3D content creators, owners and consumers will interact with, exchange, and perhaps even make physical, 3D data. Along the way, traditional notions of what represents content worthy of protection will be stretched (and perhaps broken) as the market works to navigate and find the acceptable solution for all participants in the ecosystem – allowing 3D content creators to properly monetize their creativity and hard work, while allowing 3D content consumers to leverage a rich universe of quality content, and perhaps even paying for it along the way. It won’t be easy, but there is a path forward. In early 2012 I began a series of blogs on the intersection of intellectual property with the dramatic changes influencing the 3D capture/modify/make ecosystem (of course 3D printing is but one, of many, possible outcomes of a 3D capture and design process). My first blog in this series was The Storm Clouds on the Horizon where I wrote that I felt the next “Napster” era was upon us for digitally captured real world content. There is a growing awareness and understanding of intellectual property considerations in the 3D ecosystem – whether we are talking about how it might impact consumers who wish to use their in-home 3D printers to produce an item or a company within a distributed digital manufacturing chain for a large consumer goods company. These concerns have been accelerated by the transformative technical changes on both “ends” of that ecosystem. We are at a unique point in time – when both “ends” of the capture to make ecosystem are being impacted by dramatic technological changes. The change is continuing, the pace is accelerating. 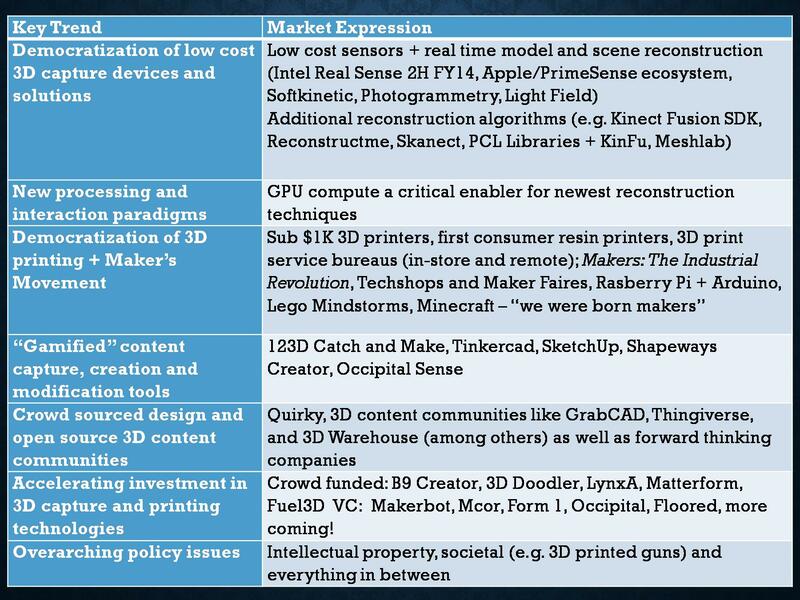 The last several years have seen many new market entrants on the consumer/prosumer 3D printing side. What is, and will be in my opinion, equally or more transformative is the impact that new low cost/smaller form factor 3D capture devices will have in this space. Consumer 3D data capture is becoming more mainstream on the consumer side as we close out 2014 – as Intel adds their RealSenseTM depth sense technology to every laptop they ship (with the first expression in the Creative Senz3D , Google progresses with Project Tango along with their software partners and other 3D data capture solutions are developed and distributed to consumers. I looked at some of these market players in an earlier blog and also examined how new passive 3D capture technologies, leveraging plenoptic (a/k/a “light field”) cameras, may find their way into your next phone or tablet. A recent research paper co-authored by Microsoft Research and published at SIGGRAPH 2014 earlier in August titled Learning to be a Depth Camera demonstrates that 3D capture and interaction can be implemented by applying machine learning techniques and minor hardware modifications to existing single 2D camera systems. With the convergence of technologies, it is likely we will see the growth of multifunction 3D capture and printing devices that attempt to offer “one button” reproduction (and transmission/sharing) of certain sized objects in certain materials. Examples even exist today – like the ZEUS – marketed as the first “ALL-IN-ONE 3D Printer / Copy Machine” as well as the Blacksmith Genesis, which started a crowd-funding campaign on Indiegogo in August. 3D Systems, Intel and Best Buy have recently collaborated on an integrated campaign called the “Intel Experience” where, in selected Best Buy stores, consumers will be exposed to 3D capture solutions leveraging Intel’s RealSense cameras along side 3D Systems 3D printing solutions. While I believe the ecosystem is lagging in producing software tools that make it easy for non-professional users to create, find and personalize 3D content, we are only a short time away from dramatic changes there too. When people can more easily digitize, share, copy and reproduce real world 3D content – how will that change the landscape for content owners and consumer alike? What existing business models will be threatened, and which new ones created, with such a transformation? What exactly “is” Intellectual Property in the Context of Digital Manufacturing? Many things! It may be represented in trade secrets – the confidential, differentiated manufacturing processes used to produce something. 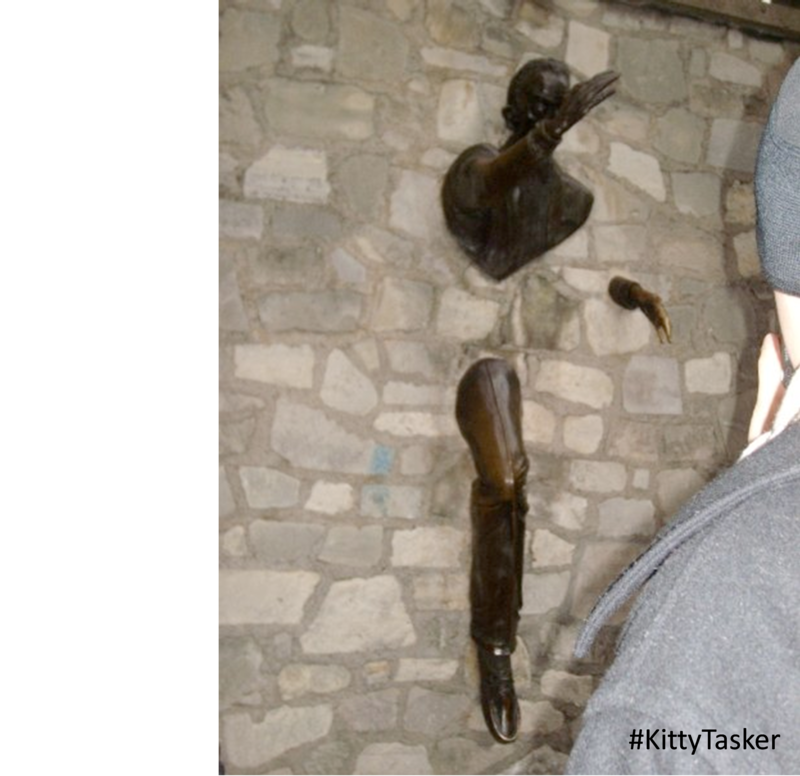 It could be represented by copyright – in for example the rights a sculptor would have in their latest creation. It might be represented by patent – in a novel, non-obvious, useful device. In the EU, a design could be protected by registered or unregistered design rights. What if your son broke the leg of his favorite action figure (which you purchased from a big box toy store) and you decided to repair it using something you produced from your 3D printer (or you could also print it to the Staples down the street or have it shipped to you from Shapeways)? What if you were able to find and download a manufacturable model (in STL format) of that action figure that someone had uploaded to one of the many model sharing sites and used that as the basis of the print job? What if the person who uploaded the file had created the model by hand (e.g. they may have looked at the same action figure you wanted to repair but they designed it on a blank digital canvas)? What if the person who uploaded the file created the representation (in the file) by 3D scanning an undamaged action figure? What if you scanned, printed, and repaired the item in your own home but did not share the files with anyone else? What if was not an action figure, but instead a retaining ring for one of the low voltage lights which keep getting run over in your front yard? Do these differences matter? Absolutely. The type of content (artistic or functional), the reason for manufacture (new item, replacement part, etc. ), how the content to be manufactured was generated (created from scratch, printable file obtained from a third party, the end result of a 3D reality capture process, from the manufacturer, etc.) and where the content will be manufactured (in your home, at a local store for pickup, on a third parties networked printer, at a remote service bureau and shipped, etc.) all matter. In some instances the content might not be protected at all, in others it might touch multiple types of third party intellectual property. What’s The Deal With Copyright and 3D Printing (follow-up article by Michael Weinberg, does a good job of explaining the important nuances in an IP analysis involving physical items versus digital representations of those models). The above is a small (but particularly useful) sample of work examining some of these issues in depth, another broader summary can be found here. You will find that authors in this space cover a broad spectrum of opinions –from those who believe that intellectual property issues need to be understood in digital manufacturing but generally inapplicable because many objects that would be manufactured are generally not protectable (e.g. Weinberg), to those who believe that the democratization of capture and printing technologies will utterly transform manufacturing supply chains and potentially substantially devalue intellectual property rights all content owners will have in the future (e.g. Hornick) as well as everything in between. I fall in the middle ground – believing that the fundamental technical and market changing technologies will stretch the concept of intellectual property, but as we have seen in the past with the music industry, that over time the ecosystem will adapt – including the law. Intellectual Property Concerns an Impediment to Continuing Growth? Companies are re-imagining supply chains: a world of networked printers where logistics may be more about delivering digital design files—from one continent to printer farms in another—than about containers, ships and cargo planes. In fact, 70% of manufacturers we surveyed in the PwC Innovations Survey believe that, in the next three–five years, 3DP will be used to produce obsolete parts; 57% believe it will be used for after-market parts. 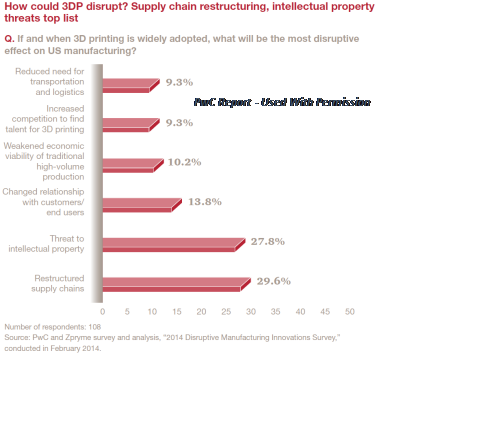 When PwC Report survey participants were asked to identify what they felt the most disruptive impact wide adoption of additive manufacturing technologies could have on US manufacturing – the “threat to intellectual property” was second only to supply chain restructuring. This concern should not really be all that surprising. By 2018, 3D printing will result in the loss of at least $100 billion per year in intellectual property globally. Near Term Flag: At least one major western manufacturer will claim to have had intellectual property (IP) stolen for a mainstream product by thieves using 3D printers who will likely reside in those same western markets rather than in Asia by 2015. The plummeting costs of 3D printers, scanners and 3D modeling technology, combined with improving capabilities, makes the technology for IP theft more accessible to would-be criminals. 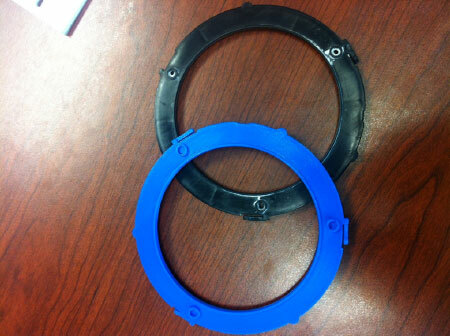 Importantly, 3D printers do not have to produce a finished good in order to enable IP theft. The ability to make a wax mold from a scanned object, for instance, can enable the thief to produce large quantities of items that exactly replicate the original. Now, I do not share the dire predictions of Gartner – as many of these hardware and software technologies have already existed for many years, but primarily because the process of creating high quality digital reproductions (either from “scratch” or from a 3D reality capture process) is still very difficult, even for experienced users. But over time, and with almost certainty in the market for certain consumer goods, if someone could manufacture something in their home at comparable cost and quality to what they could buy at a store, why wouldn’t they? Obviously there must be a willingness of content owners to share and distribute their intellectual property for distributed manufacturing – whether as part of a collapsing supply chain for industrial manufacturers, or to authorize someone to produce a licensed good in their own home. 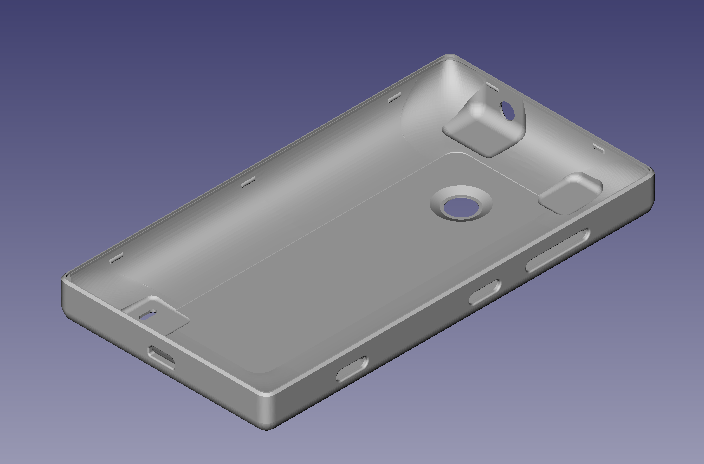 We are seeing companies test the water – from the Nokia experiment in early 2013 (prior to the Microsoft acquisition) to provide STL and STEP models of certain phone cases for 3D printing, to Honda releasing their 3D “design archives” in early 2014. A few months ago Hasbro licensed a handful of artists to create derivative works based on their My Little Pony line of toys and then those artist designed customizations could be purchased from Shapeways. To be clear, Hasbro did not authorize anyone to create customizations of their licensed works, but rather started with a single design, customized by a handful of artists, to start. Buoyed by the success of this launch, Hasboro and Shapeways are now soliciting designers to create customized 3D printable designs based on Dragonvale, Dungeons & Dragons, Monopoly, My Little Pony, Scrabble (to be sold in the US and Canada only) and Transformers – with upload instructions posted to Superfanart.com in late August 2014 (which now points as subdomain to Shapeways.com). What will accelerate the types of projects piloted by Nokia, Hasboro and Shapeways? I’ll examine each of these issues, and potential resolutions, in more detail below. There are clear parallels (in my mind at least) to the music industry – what lessons can be learned from the digitization and distribution of digital content there? Which business methods are ultimately prevailing? The de-facto standard used for digital manufacturing is and has (and remains) the STL (from “STereoLithography” a/k/a “Standard Tessellation Language”). STL has the benefit of being well known and computationally easy to read and process. Most manufacturing systems require triangulated models to get sliced for processing (e.g. CAM, 3D printing, etc.). The challenges with STL, however, are many – it does not scale well to higher resolutions, there is no native support for color or materials properties, it is unit-less, and it does not compress well (among others). A new standard has been proposed to replace the STL format, it is known as the AMF (for “Advanced Manufacturing Format” a/k/a “STL2”). Al Dean reviewed the AMF and compared it to STL in his January 2013 DEVELOP3D article Alpha-Mike-Foxtrot to STL. More useful background can be found at the AMF Wikispace. This standard also does not purport to address any copyright and intellectual property concerns, if any, associated with its use. It is the responsibility of the user of this standard to meet any intellectual property regulations on the use of information encoded in this file format. Further, the AMF specification is lacking support for metadata containers which would allow for the file content to be self-describing at some level. Shapeways has decided to enter the fray and announced their own voxel based file format for 3D printing called SVX at the end of September. As with STL and AMF, the SVX specification does not address intellectual property. What is needed? A file format (AMF or an alternate) for manufacturing which specifically allow for metadata containers to be encapsulated in the file itself. These data containers can hold information about the content of the file such that, to a large extent, ownership and license rights could be self-describing. An example of this is the ID3 metadata tagging system for MP3 files. Of course the presence of tag information alone is not intended to prevent piracy (i.e. like a DRM implementation would be), but it certainly makes it easier for content creators and consumers alike to organize and categorize content, obtain and track license rights, etc. Most 3D printing service bureaus and model hosting sites have licensing terms which are only concerned with copyright, rather than dealing more broadly with the entire “bucket” of potential intellectual property ownership and licensing concerns. Several rely on the Creative Commons licensing scheme (or some variation thereof) as the foundation for the licensing relationship between their content creators/contributors, content consumers/users and their own services. Worrying only about copyright, or exclusively using the CC licensing scheme for manufacturable 3D content (via 3D printing or otherwise) is misguided. Creative Commons explored the creative/functional split in a Wiki for the 4.0 release of licenses, but did not develop a framework for a license covering both types of content. 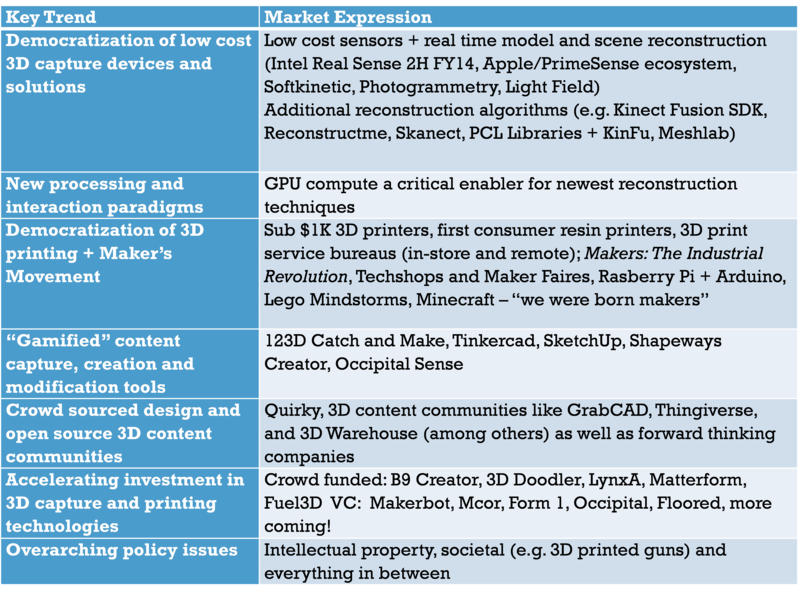 I examined these issues previously in more detail in a two part blog The Call for a Harmonized “Community License” for 3D Content. While dated, those materials can be useful background. Why does this matter? There is presently no licensing consistency among the various players in the digital manufacturing ecosystem – potentially meaning that there are tens, or even hundreds of “flavors” of a license grant, for the same content. What is Needed? An integrated, harmonized licensing scheme addressing all of the intellectual property rights impacted in the digital manufacturing ecosystem – drafted in a way that non-lawyers can read and clearly understand them. This is no small project, but needs to be done. Harmonization would simplify the granting and tracking of license rights (assuming stakeholders in the ecosystem helped to draft and use those terms) and could be implemented in conjunction with the file format metadata concept described earlier. At least one organization is working on a new model for licensing, utilizing a community approach to drafting and feedback – driven by Joris Peels the YouMagine Community Manager (and long time participant in the 3D printing ecosystem). You can find the current progress here. 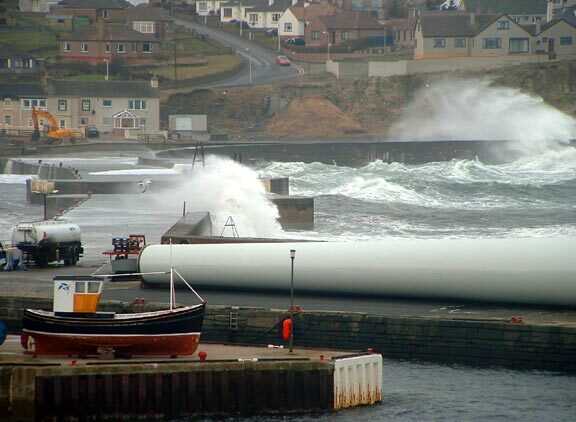 Do the “Safe Harbor” Provisions Apply? It is possible, via secondary or vicarious liability, to be held legally responsible for intellectual property infringement even if you did not directly commit acts of infringement. In 1998 the Digital Millennium Copyright Act (the “DMCA”) became law in the United States. The DMCA, among other notable things (such as criminalizing anti-circumvention protections such as DRM), creates limitations on the liability of online service providers for copyright infringement by third parties when engaging in certain types of activities – primarily relating to the transmission, storage and searching/indexing of data. These have become known as the “safe harbor” provisions of the DMCA. To receive these protections, service providers must comply with the conditions in the Act, including providing clear “notice and takedown” procedures which permit the owners of a licensed content to stop access to content which they allege to be infringing. The DMCA provides a “safe harbor” to service providers for copyright infringement, if for example, it turns out that they, for example, hosted or store content upload by a third party which was found to be infringing. There are a few key limitations: (1) the content may not be modified by a service provider (if it is, the DMCA safe harbor protections do not apply); and (2) the DMCA only limits liability for copyright infringement, it does not help protect a service provider from other potential forms of infringement. The first DMCA “take down” notice for 3D printed content was sent to Thingiverse (now part of Stratasys) in February 2011 for a Penrose Triangle which could be 3D printed – likely content not protectable by copyright in the first place. 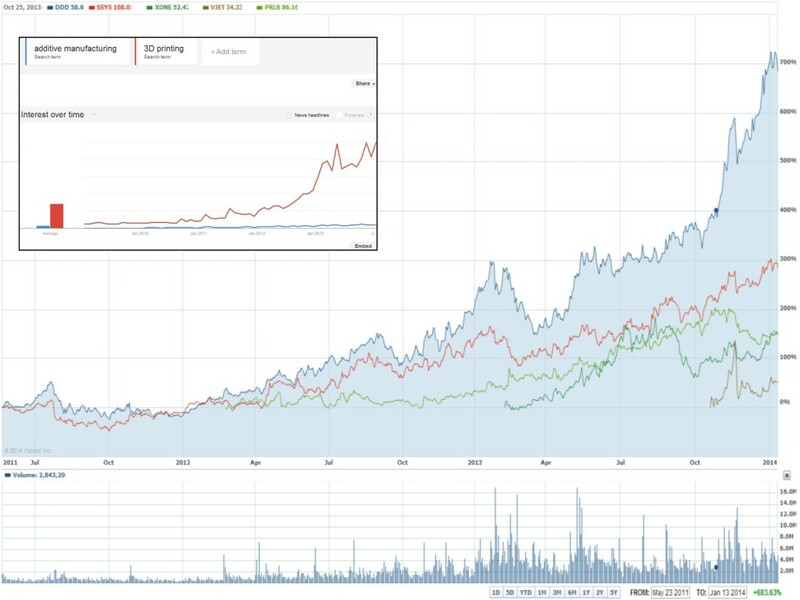 Shapeways [link: ] and many others in the ecosystem commented on the notice and what it meant for the industry at large – how do you reward legitimate creators/inventors in a world of “copy paste”. You can see examples of how companies have implemented a DMCA notices on the 3D Systems Cubify site (see Section 9) and on Shapeways. There are obviously others. Unfortunately, in the world of distributed digital manufacturing there is the potential for more than just copyright infringement – functional items which are manufactured and used may (and I stress may) violate third party patents, trademarks, trade dress, design rights, etc. This could open up participants in the digital manufacturing chain to claims of secondary infringement for rights other than copyright. These are typically much more difficult claims to make (just by the nature of what needs to be demonstrated under the law) – but potentially chilling nevertheless. What is Needed? Extension of the concepts in the DMCA to cover the broader bucket of intellectual property rights beyond copyright. Desai and Magliocca, in Section III(c) of the Patents Meet Napster: 3D Printing and the Digitization of Things article I referenced earlier reach a similar conclusion and propose a framework for implementation. Such changes need to be considered and implemented in a way which does not create or extend secondary liability to more players in the ecosystem, but rather provides a safe harbor for certain non-copyright claims should infringement liability otherwise exist. Forward thinking content owners, like Hasbro and others, recognize that over the next several years there will be substantial transformation in the digital manufacturing ecosystem. Intellectual property metadata in self-describing digital files, harmonized licensing schemes and revised statutory frameworks will help accelerate these changes. Ultimately, there is a universal market need for an intellectual property licensing, clearance and payment infrastructure to support the seamless distribution and payment for manufacturable content. Hundreds of billions of dollars worth of consumer goods alone are likely to be manufactured (in the home, at a store, at a remote service bureau on demand, or by the consumer goods company themselves) on annual basis using additive manufacturing technologies. When content creators have an easy way to monetize their content through licensing, content consumers can find and pay for quality content which meets their needs, and simple personalization tools have been created, we will truly see a transformation in digital manufacturing. Note: The majority of the content in this post was originally published in the September 2014 edition of DEVELOP3D Magazine, it has been updated and refreshed. 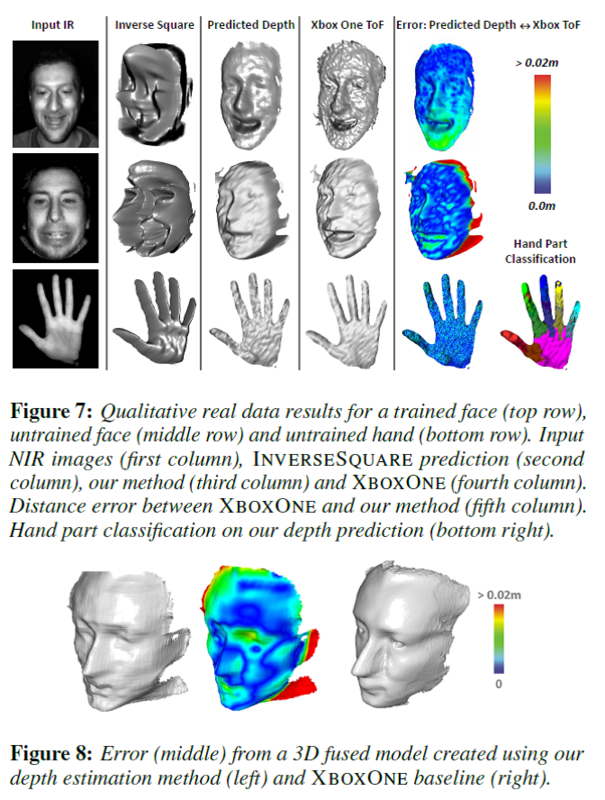 Learning to be a Depth Camera for Close-Range Human Capture and Interaction [(Microsoft Research project which proposes a machine learning technique to estimate z-depth per pixel using any conventional single 2D camera in certain limited capture and interaction scenarios [hands and faces] – demonstrating results comparable to existing consumer depth cameras, with dramatically lower costs, power consumption and form factor). This one, admittedly, blew me away. I have been interested in the consumer reality capture space for a while, and have blogged previously about the PrimeSense powered ecosystem and plenoptic (a/k/a “light field”) computational cameras. I argued that light field cameras made lots of sense (to me at least) as the technology platform for mobile consumer depth sensing solutions (form factor, power consumption, etc.). This new paper from Microsoft Research proposes a low cost depth sensing system for specific capture and interaction scenarios (the geometry of hands and faces) – turning a “regular” 2D camera into a depth sensor. Admittedly doing so requires that you first calibrate the 2D camera by registering depth maps captured from a depth camera against intensity images, and in this way the 2D camera “learns” and encodes such things as surface geometry and reflectance among other things. They demonstrate two prototype hardware designs – a modified web camera for desktop sensing and a modified camera for mobile applications – in both instances demonstrating hand and face tracking on par with existing consumer depth camera solutions. This paper is a great read, in addition to describing their proposed techniques, they provide a solid overview of existing consumer depth capture solutions. First-person Hyper-lapse Videos – paper + Microsoft Research site (presentation of a method to convert single camera, first-person videos into hyper-lapse videos, i.e. time lapse videos with smoothly moving camera – overcoming limitations of prior stabilization methods). What does this mean? If you have ever tried to take a video that you shot (particularly while the camera is moving) and slow it down – the results are often not optimal. Because frames need to be “made up” to fill the gaps, any camera movement introduces blurring. Techcrunch reviewed the Microsoft Research project here. 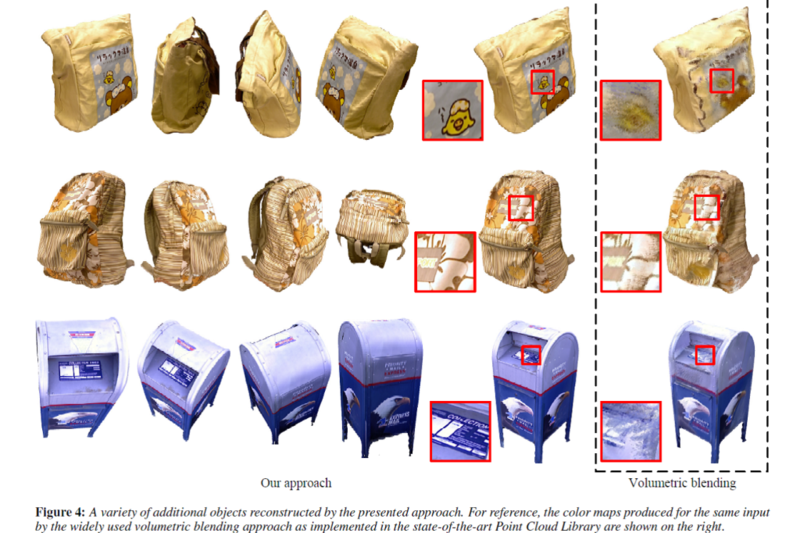 Real-time Non-rigid Reconstruction Using an RGB-D Camera (a proposed hardware and software solution, using consumer graphics cards, for markerless reconstruction in real-time (at 30 Hz) of arbitrary shaped (i.e. faces, bodies, animals), yet moving/deforming physical objects). Real-time reconstruction of objects or scenes without moving elements are the bread and butter of solutions such as Kinect Fusion. Real-time 3D reconstruction of moving objects, in real time, is much more challenging. Imagine, for example, having your facial expressions and body movements being “painted” in real-time, to your avatar in a virtual world. While this solution requires a custom rig (i.e. high quality capture at close range was needed, something consumer depth cameras do not provide) it is certainly exciting to see what can be achieved with relatively modest hardware modifications. Functional Map Networks for Analyzing and Exploring Large Shape Collections (proposes a new algorithm for organizing, searching and ultimately using collections of models – first by creating high quality maps connecting the models, and then using those connections for queries, reconstruction, etc.). Much of this paper was beyond me – but the problem is certainly understood by everyone, who even today, searches for 3D content. Most of that data is organized/categorized by metadata – and not be the characteristics of the shapes themselves. There are obviously some services, like 3DShap.es, which are actually interpreting and categorizing the underlying shape data – but most model hosting sites do not. Imagine if you could run an algorithm against a huge database of content (e.g. Trimble’s 3D Warehouse), or even shapes when “discovered” on the web, and immediately build connections and relationships between shapes so that you could ask the query “Show me similar doors”. Wow. There is a growing awareness and understanding of the intellectual property considerations in the capture/modify/make ecosystem – particularly as it relates to content that is captured via a 3D scanner, modified or mashed up, and then manufactured (via 3D printing or otherwise). 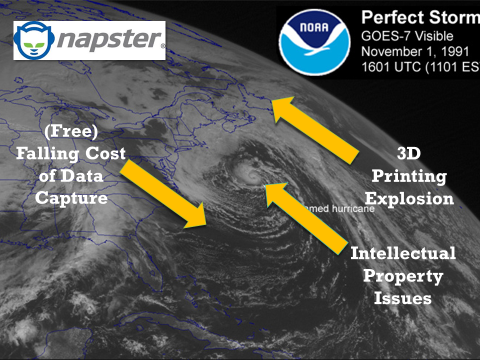 I have written about this before – blogging early in 2012 in The Storm Clouds on the Horizon that I felt the next “Napster” era was upon us for digitally captured real world content. In the last two years there have been transformative technical changes on both “ends” of that ecosystem, consumer/prosumer 3D printing solutions along with an emerging class of inexpensive 3D real world capture devices and software solutions. Intellectual Property Concerns in Scene Based 3D Capture? I’d point you to the on-going discussion around the metes and bounds of intellectual property protection in the object based capture/modify/make ecosystem is interesting context for some high level issue spotting with the intersection of intellectual property and scene/world based reality capture (as part of a formal digital documentation process or as part of an informal, crowd-sourced creation of a 3D world model). What you’ll find is a lot of gray areas, inconsistencies, and mind melting information. Understanding intellectual property in the context of scene based scanning will become more relevant over the coming years for many of the same reasons that have driven change and awareness in the context of capturing and reproducing objects. The falling cost of high accuracy scanners useful for scene based 3D capture (e.g. the FARO Focus3D family means that more data will be captured, by more users, in the commercial context (either directly by the owner/operators themselves or by third party scanning service bureaus). Similarly, 3D data capture will become ubiquitous on the consumer side later in 2014 and beyond – as Intel adds their RealSenseTM depth sense technology to every laptop they ship, Google progresses with Project Tango along with their software partners and as lightfield camera technology goes mainstream. In my opinion, we are not too far away from the creation and continuous update of a 3D “world model” populated with data coming from various types of consumer, professional and industrial sensors. 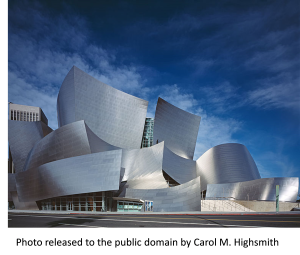 Intellectual Property Applies to Buildings and Public Spaces? 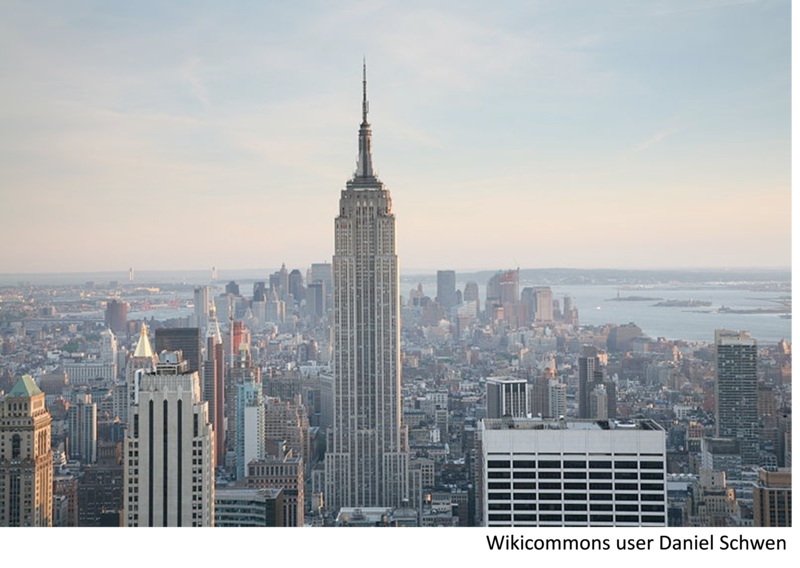 I hate to be the bearer of bad news, but to answer the question, “yes” intellectual property rights may be impacted if you capture 3D data of a building, public spaces or other real world scenes. That’s probably surprising to many of you. For purposes of this discussion I’m only going to focus on how the laws in the United States might apply (and in many respects they differ from other countries around the world – for an example of just how interesting/different that can be, see: http://3dsolver.com/the-40-or-20-million-helmet-or-not/). Your mileage can and will vary, this is presented to help with issue spotting – and not to provide definitive guidance on any particular situation. I had the opportunity to speak on this topic with Michael Weinberg from Public Knowledge at a FARO Digital Documentation Conference a few years ago – many of the issues and examples we discussed then are still relevant now (and even more so with the explosion of low cost 3D capture solutions). 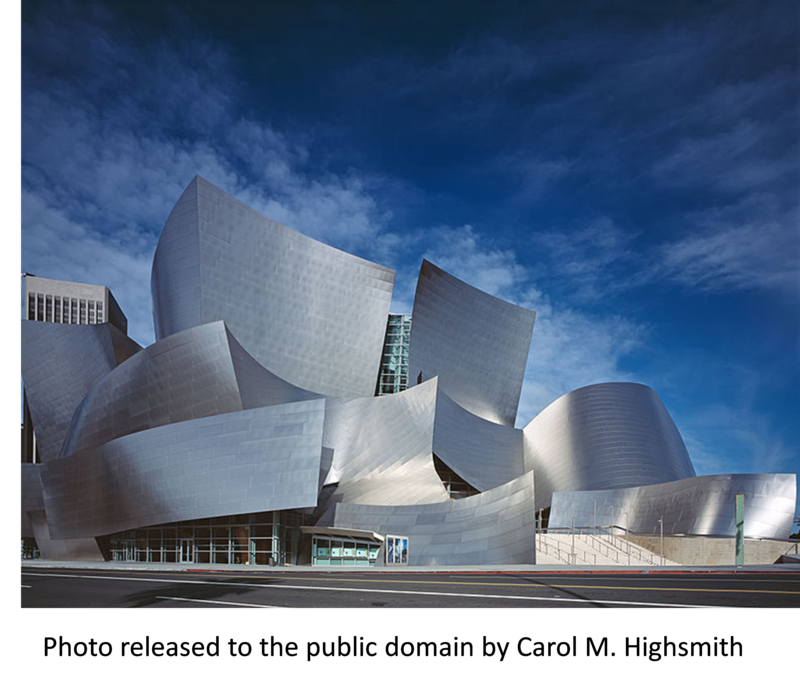 You Can Infringe Intellectual Property By Scanning A [Building] [Lobby] [Plaza] [etc.]? The intellectual property ramifications of capturing 3D data in the context of a scene is very muddled. Very little case law addresses these issues, and that which does, isn’t very clear. 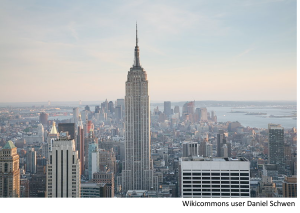 Naturally, most buildings would not be copyrightable because, by their very nature, they are “useful” – and something that is useful is generally not afforded copyright protection (yes, useful objects can be patented, and you can actually patent certain building elements – but that’s a topic for a different day). But think about something like a sculptural memorial that is in a public plaza. Would the sculptor of the memorial be afforded copyright protection? You betcha, as a sculptural work is specifically protected under the United States Copyright Act. 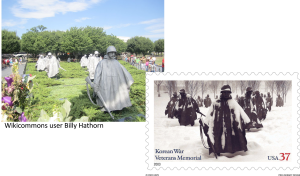 What if you were to take a picture of that memorial and decide to license it to the United States Postal Service for use on a postage stamp. Would that picture, and re-use, require you to obtain clearance (in the form of a license) from the sculptor before you could do so, and before the USPS could sell the stamps? According to the 5th Circuit Court of Appeals, when they looked at this question in 2010 – the answer was “yes.” The failure to get a license from the sculptor, even though the defendant obtained one from the general contractor which installed the sculpture, constituted copyright infringement. After remand back to the United States Court of Federal Claims, and a subsequent appeal, the sculptor, Frank Gaylord, was awarded $685,000 in the fall of 2013. So what if you plopped your scanner in the middle of that field and captured a 3D point cloud (that mere act is likely infringing)? What if you decided to sell that data to a third party and then printed 3D prints from the data? What if you used that data as part of an immersive augmented reality platform to promote tourism for Washington DC? Would you/could you be liable? OK Sculptures Maybe, But A Building? A building is the essence of utilitarian and functional, so we are safe from copyright, right? You might think so. But you’d be wrong. 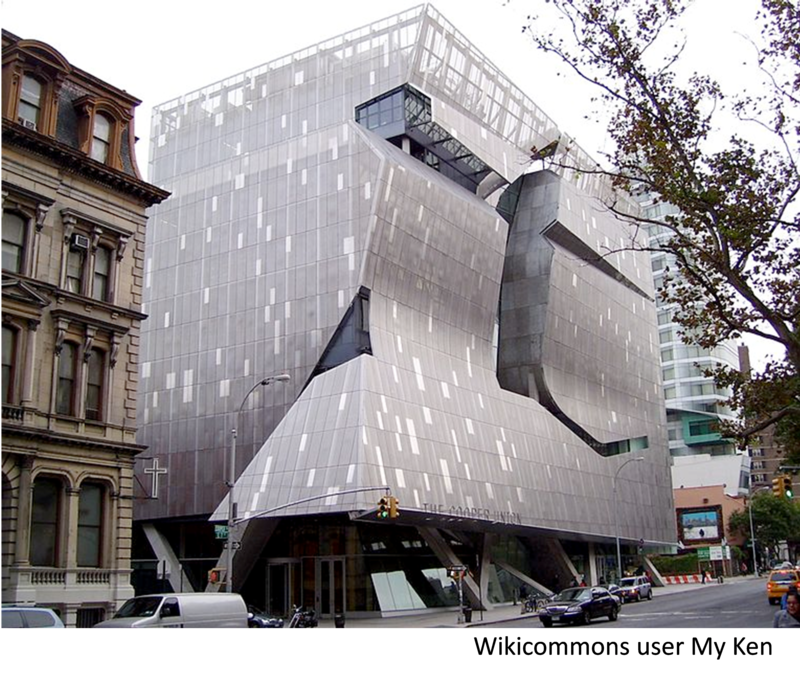 Take for example the above, which is the Cooper Union New Academic Building in New York City. 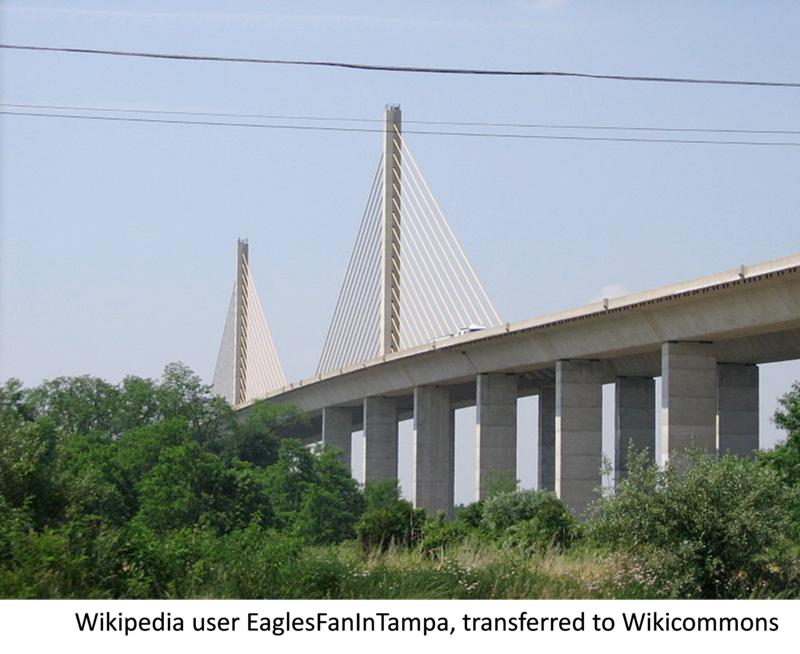 Construction was finished in 2009. Still utilitarian and functional (umm, as a building) so not copyrightable, right? Wrong. 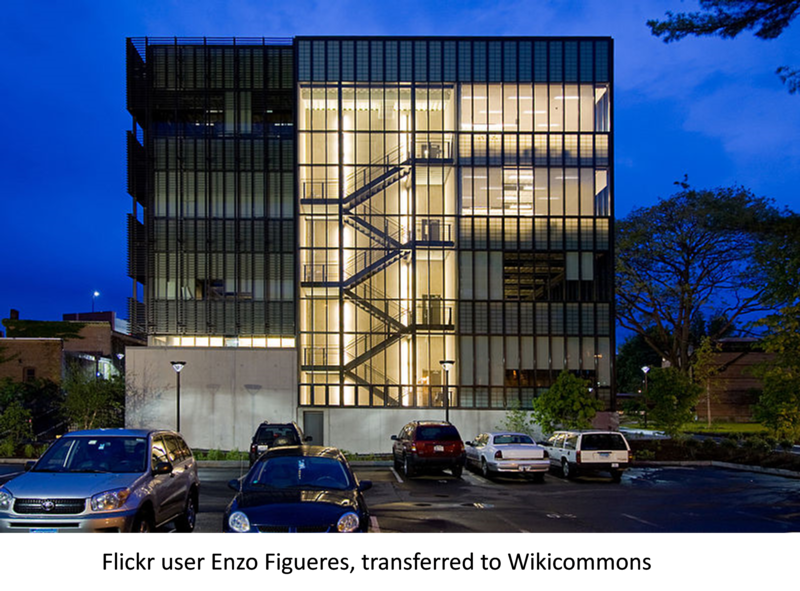 In the United States, under the Architectural Works Copyright Act of 1990 a building designed (and that design is fixed in a tangible medium – i.e. drawings, or actually constructed) after 1990 is specifically subject to copyright protection (although purely functional or utilitarian aspects of a building are not protected). So, if you set up your 3D scanner on the sidewalk here and captured a point cloud of the Cooper Union New Academic Building, have you committed an act of copyright infringement? It’s a bridge, so the essence of utilitarian and functional. It also has significant artistic and sculptural elements. Since it’s not intended for human habitation, the Architectural Works Copyright Act does not apply. Phew. How about this pavilion built at the Fort Maurepaus beach park, located in Ocean Springs, Mississippi and constructed by FEMA after Hurricane Kartrina? Folks aren’t supposed to live in pavilions, so we are safe, right? Wrong. 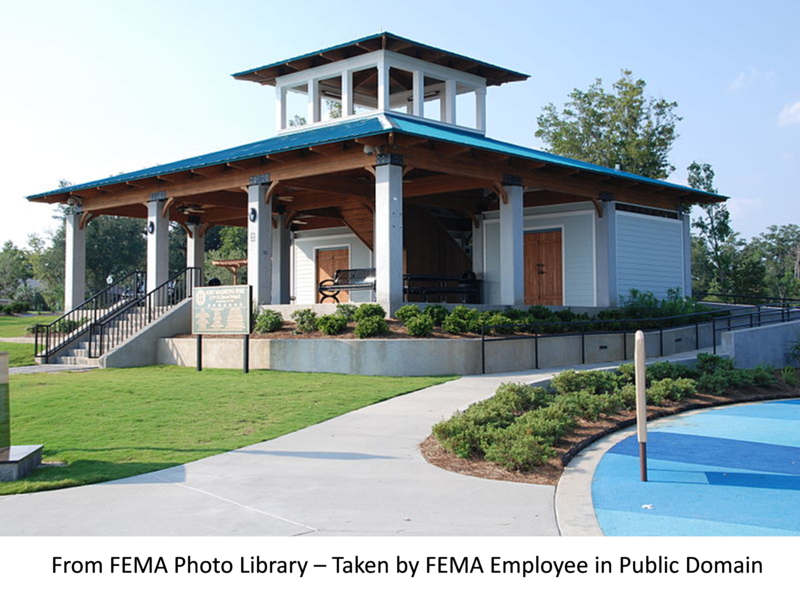 Pavilions are specifically covered by the Architectural Works Copyright Act. Only if it was built after 1990. And it was. Oye. But Wait, We Have An Exception! United States Copyright Act, 17 U.S.C. Section 120 (as amended). Yippee, so if we user our 3D scanner to capture a point cloud of a building we are saved by the so-called “photographer’s exception” for buildings that have been constructed and can be seen from a public place. Right? Unfortunately it’s a big “I have no idea but don’t think so but couldn’t find any case law that answers this question”. The above is a photo of Baltimore Penn Station. This was certainly built before 1990 – so no protection under the AWCA. Even if it was built after 1990 – we would still OK because it would be covered by the photographer’s exception (assuming that applied to 3D data acquisition), right? Wrong. Even if that exception were extended to 3D data capture via scanning, that specific statutory exception does not apply to sculptures (or other objects protected by copyright) which are separable from a building. [FWIW, the sculpture is called Male/Female by Jonathan Borofsky]. Other countries (e.g. Canada, Ireland, the UK) extend the photographer exception concept to all publicly located, but otherwise copyrightable, works (e.g. sculptures). Not in the United States though. Think You Are Confused Now? What about a sculpture in a building? Or how about a sculpture that is attached to a building? In addition to the various intellectual property concerns that are potentially touched about when 3D scenes are captured, I believe there a host of other privacy and ownership issues that need to be thought through as well. If I’m a facility owner, and I don’t want data captured – how do I prevent it as devices become more ubiquitous? Sure, I can require people to leave their phones at the security desk (many secure facilities already have no photography or data transfer processes), but what do I do about their glasses? If I’m a contributor of 3D data to a community sourced 3D “world model” who owns the data that I capture and upload? Who is responsible if it is ultimately found to be infringing? What are the policy and legal implications if Google, instead of capturing photographs for their street maps, instead, created 3D point clouds of every place they went? So what can you do minimize your risks if you are a commercial scanning service provider and are engaged to do some scene based scanning? Ask questions — Know enough to generally understand the potential risks and pitfalls of any data capture engagement. Transfer liability and responsibility for clearance – As a service provider, make sure that the owner/operator or the entity which engaged you to do complete the work is responsible for intellectual property clearance issues and agree to hold you harmless (e.g. they are responsible, not you, for any potential infringements). Be especially careful with artistic elements – Creative and sculptural elements should be subject to more scrutiny. 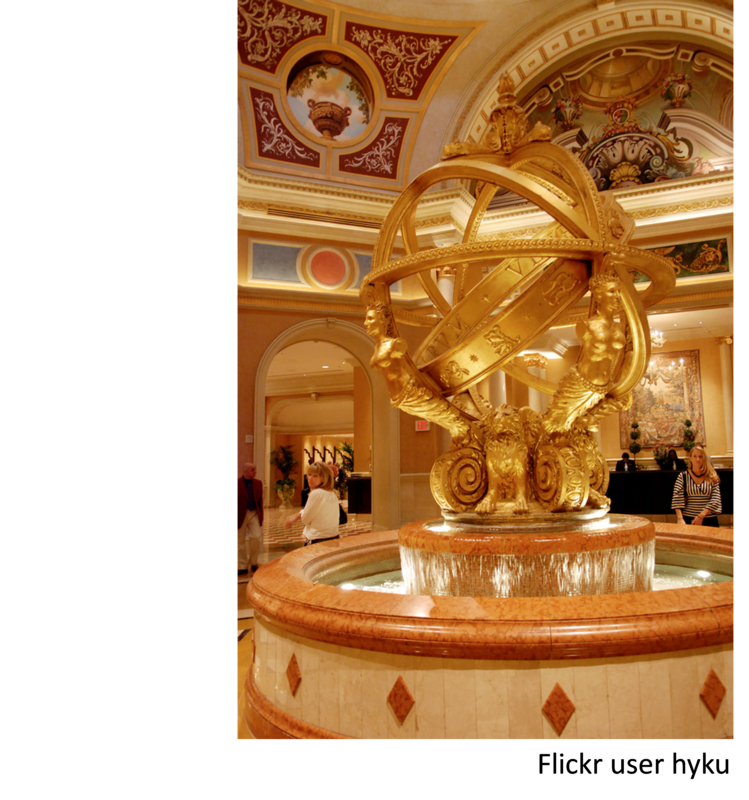 For example, if you are asked to scan a building lobby, and there is a sculpture in the middle of it, you should specifically get clearance from the artist. Know how the collected data will be used — Be absolutely clear on the data ownership and the plans for downstream use. Is the data going to be used as part of a digital documentation process (so no broad public dissemination) or is going to be published and made accessible as part of an augmented reality application? Tom Kurke was the former President and Chief Operating Officer of Geomagic, a specialist supplier of 3D reconstruction and interaction software and hardware solutions – which was acquired by 3D Systems Corporation (NYSE: DDD) earlier this year. Prior to Geomagic he spent more than a decade with Bentley Systems, a leading providing of solutions to the designers, constructors owners and operators of some of the largest constructed assets in the world. He recently joined the Board of Advisors of Paracosm (www.paracosm.io) whose mission is to “3D-ify the World.” When not supporting his two sons various sporting activities, or writing on topics of interest in the areas of 3D printing, digital reality capture, intellectual property, AEC/GIS or unmanned aerial systems at www.3dsolver.com, you might see him finding new ways to crash his quadcopter. My friends over at DEVELOP3D have a great June 2014 issue (click here to download, you will need to register first) – the cover story is one that is near to my heart, namely the intersection of intellectual property and 3D content. Starting on page 20 of the DEVELOP3D June 2014 issue, Stephen Holmes details the historical intellectual property battle between Magmatic Ltd. and PMS International Limited surrounding travel cases for children, the potential implications for the industry, and the campaign started by Rob Law (the founder of Magmatic) to re-visit some of these issues in the UK Supreme Court. I urge you to register, download and read this (and subsequent!) issues of DEVELOP3D Magazine (either online or in print). Magmatic had protected the Trunki family design via a Community Registered Design (a “CRD”). While the metes and bounds of a CRD are outside the scope of this short article, the International Trademark Association (“INTA”) has published a very useful “fact sheet” on a CRD. Applications for CRD’s are not substantively reviewed, but at a minimum must contain a representation of a product design, and protect that specific appearance. PMS International Limited (“PMS”) subsequently developed a competitive children’s case, called the Kiddee. 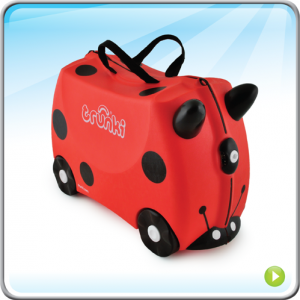 Magmatic sued PMS for infringing the CRD, its UK unregistered design rights in the design of the Trunki and its copyrights associated with the packaging for the Trunki. The UK High Court found, in an opinion dated July 11, 2013, that PMS had infringed the CRD and the design right in four of the six designs. The copyright infringement claim was dismissed (except for one count which PMS conceded). 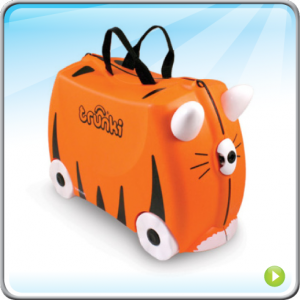 There is little doubt that PMS developed its line of children’s travel cases to be directly competitive with Magmatic — as nearly 20% of all three to six year olds in the UK owned a Trunki case (from Magnetic’s research). In the United States we do not have a statutory intellectual property method akin to a CRD (copyright, trade dress, design patents, etc. can be used, but nothing that parallels the CRD). Separately, you maybe interested in reading how a US and UK court examined the same set of facts and came to completely diverging opinions on whether an item was protectable by copyright (in this case it was a Star Wars Stormtrooper helmet. See my earlier blog – http://3dsolver.com/the-40-or-20-million-helmet-or-not/ (US court concluded that the helmets were copyrightable, UK court held they were not because they were “functional” items in the context of a movie). Magmatic appealed the High Court’s decision. 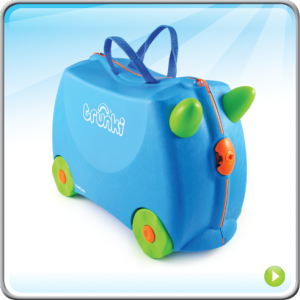 On February 28th, 2014 the UK Court of Appeal rendered its decision (the “Appeal”) overturning the lower court and holding that PMS, with its Kiddee case, had not infringed Magmatic’s CRD for the Trunki. Infringement, especially in the case of copyrights, registered designs, and design patents, is always a subjective one – there is simply no black and white test. The decision on appeal here turned on the specific frame of reference the Court of Appeal used for the CRD infringement analysis, “[a]t the end of the day, the scope of the design must be determined from the [CRD] representation itself.” Appeal Finding 36. In other words, how the products actually look in the marketplace isn’t relevant to whether a competitive product infringes rights in a Community Registered Design – what matters is the design and materials submitted as part of the application process. [b]efore carrying out any comparison of the registered design with an earlier design or with the design of an alleged infringement, it is necessary to ascertain which features are actually protected by the design and so are relevant to the comparison. If a registered design comprises line drawings in monochrome and colour is not a feature of it, then it cannot avail a defendant to say that he is using the same design but in a colour or in a number of colours. Appeal Finding 37. 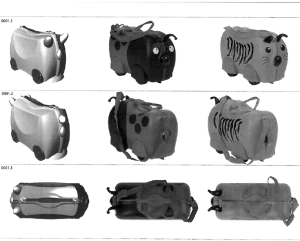 The Court of Appeal concluded that the High Court had erred by concluding that the infringement analysis solely related to the shape of the suitcases – when distinctive design elements were present in the CRD beyond shape. Appeal Finding 40. The Court of Appeals found that the High Court was wrong in two primary respects: (1) the designs submitted were not wireframes (and so not restricted to shape), but were instead “six monochrome representations of a suitcase”. . .”which, considered as a whole, looks like a horned animal” Appeal Finding 41; and (2) because submitted in monochrome, the various shadings should be interpreted as distinct design elements (e.g. Magmatic could have been depicted the wheels in a similar shade as he rest of the body, but chose not to). Appeal Finding 42. 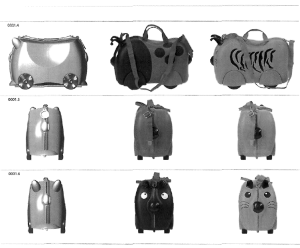 Image Source – Annex to the Appeal (from left to right in each row, first image is the Trunki case design submitted as part of the Magmatic CRD, followed by two images of representative Kiddee cases in the market, Trunki case design, and then two more images of the Kiddee cases). [T]he overall impression created by the two designs is very different. The impression created by the CRD is that of a horned animal. It is a sleek and stylised design and, from the side, has a generally symmetrical appearance with a significant cut away semicircle below the ridge. By contrast the design of the Kiddee Case is softer and more rounded and evocative of an insect with antennae or an animal with floppy ears. At both a general and a detailed level the Kiddee Case conveys a very different impression. Many commentators have said the practical takeaway guidance from this decision is that those seeking protection via a CRD should generally avoid surfaced 3D representations in their CRD filings, and instead use wireframes. The logic is that if only wireframes are used, then surface markings, color, etc. are irrelevant in a CRD infringement analysis. Since at least one part of the Court of Appeals decision focused on the purposeful difference in the wheel color chosen by Magmatic, that would have been irrelevant if they had used wireframes. I am certainly no expert in UK law, nor that relating to CRD registrations, but I do not believe that this case represents bad law, as much as it does a bad set of facts for the Plaintiff, Magmatic. If Magmatic had submitted wireframes as part of their CRD, then PMS would have most certainly first claimed that the CRD itself was invalid because it wasn’t novel or possess enough individual character to warrant protection – the very things that colors, surface markings, lettering, etc. can bring to a simplified shape which make it more unique and protectable as a CRD. It could be argued that many of the design elements were functional, and therefore not protectable (e.g. cases need wheels, they have straps, clasps, etc.) – particularly if depicted as a wireframe. Ultimately though, if Magmatic had submitted wireframes for its CRD, wouldn’t it still have looked like a “horned animal” as opposed to an “insect” to the Court? Look at the above images and ask yourself. Their position might have been stronger (if the underlying CRD were deemed to be valid), but would it have changed the outcome? 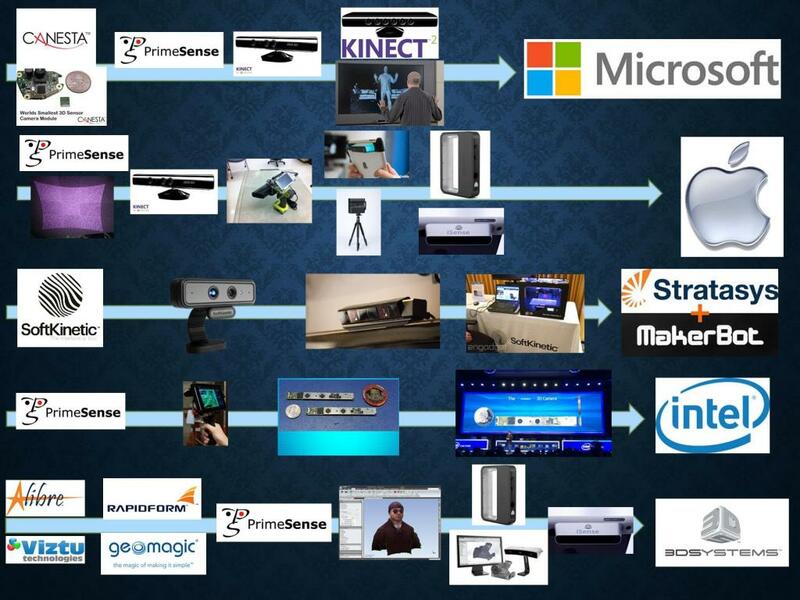 There has been a continuing strong push on the consumer/prosumer 3D reality capture side of the capture/modify/make ecosystem – whether that captured content is to be used in an object or scene based scanning workflow. New processing algorithms along with orders of magnitude improvement in processing power are unlocking new capabilities. DIY scanning solutions have been around for a while – ranging from pure photogrammetric approaches, to building structured light/laser scanning setups (e.g. see the recommendations which DAVID 3D Solutions GbR makes on the selection of scanning hardware, by leveraging commercial depth sense cameras in interesting new ways (e.g. leveraging PrimeSense, SoftKinetic or other devices to create a 3D depth map or by utilizing light field cameras for 3D reconstructions . Occipital raised $1M in their Kickstarter campaign to develop their Structure Sensor (which is powered by PrimeSense technology) hardware attachment for Apple devices and 3D Systems is white labeling that solution. Google has been working on Google Tango with its project partners (and apparently Apple – because the Google Tango prototype included PrimeSense technology)! LazeeEye? Seriously? The name “LazeeEye” is a portmanteau of “laser” and “eye,” indicating that your phone’s camera (a single “eye”) is being augmented with a second, “laser eye” – thus bestowing depth perception via stereo vision, i.e., letting your smartphone camera see in 3D just like you can! How does LazeeEye work? The enabling technology behind LazeeEye is active stereo vision, where (by analogy with human stereo vision) one “eye” is your existing smartphone camera and passively receives incoming light, while the other “eye” actively projects light outwards onto the scene, where it bounces back to the passive eye. The projected light is patterned in a way that is known and pre-calibrated in the smartphone; after snapping a photo, the stereo vision software on the phone can cross-reference this image with its pre-calibrated reference image. After finding feature matches between the current and reference image, the algorithm essentially triangulates to compute an estimate of the depth. It performs this operation for each pixel, ultimately yielding a high-resolution depth image that matches pixel-for-pixel with the standard 2D color image (equivalently, this can be considered a colored 3D point cloud). Note that LazeeEye also performs certain temporal modulation “magic” (the details of which we’re carefully guarding as a competitive advantage) that boosts the observed signal-to-noise ratio, allowing the projected pattern to appear much brighter against the background. Depending on the funding level you select during the campaign you get different hardware – varying laser colors (which impact the scan quality), whether it is aligned, SDK access, etc. They readily acknowledge that 3D capture technologies will become more ubiquitous in the coming years with the next generations of smartphones (whether powered by active technology like the PrimeSense solutions or passive solutions such as light field cameras) – their answer – why wait (and even if you wanted to wait, their solution is more cost effective). Why wait indeed. Interesting application of existing technical solutions packaged in a cheap approachable package for a DIY consumer, will be curious to see how this campaign finishes up.